Global steel production is at an all-time high after March volume reported by World Steel Association. 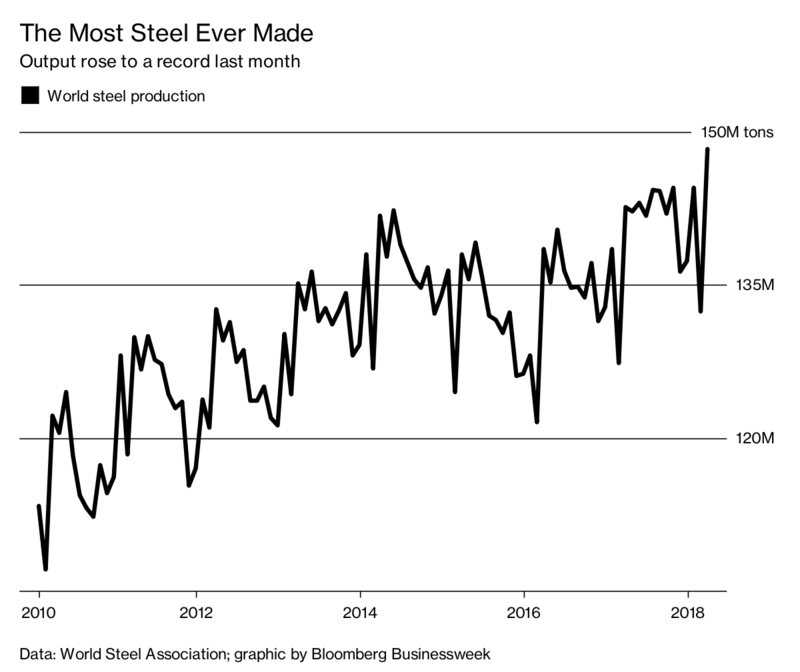 There has never been more steel produced in one month than March 2018. There are 64 countries that report steel production to the World Steel Association and in March 148.3 million tons of crude steel was produced. In March 2017 crude steel production came in at 142.7 million tons. The year over year (YOY) growth as a result for this record month is a 4% increase in production. The following chart from Bloomberg plots the increase in global output since 2010 culminating in the March 2018 peak. China produced half of record global steel production in March 2018. According to the report half of global crude steel output came from Chinese mills. 63 countries combined to produce 74.4 million tons of steel while China produced 74 million tons of steel on its own. Compared to March 2017 this is a 4.5% rise in steel production. Their production falls in line with the year over year global increase. 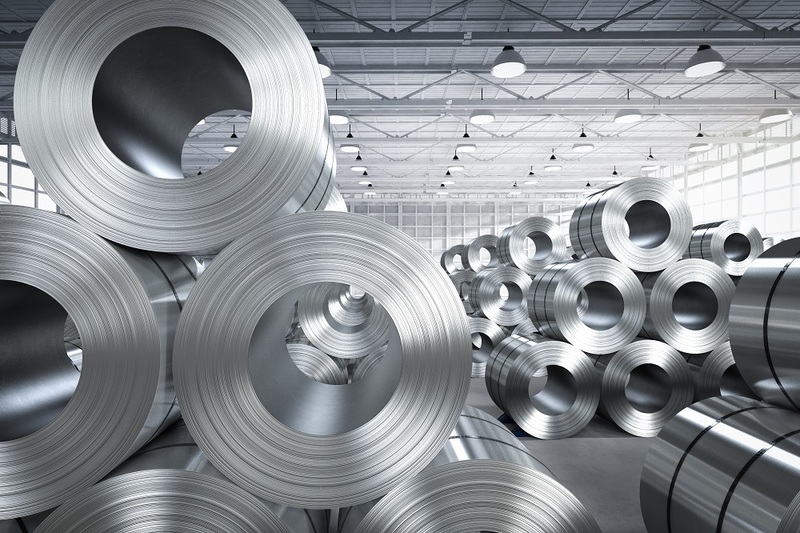 However, while China produced an additional 9 millions tons of steel in March compared to February, their YOY increase dropped from 5.9% to the aforementioned 4.5%. There was no difference for the rest of world in YOY growth when comparing the record March to February. The number 2 steel producer in the world, India, contributed a crude steel output of 9.2 million tons in March. Japan would just fall shy of India’s output with 9.1 million tons of steel produced. 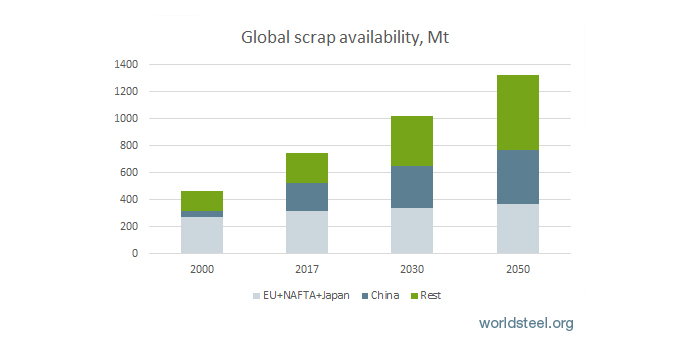 The growing amount of global scrap availability will most likely have an effect on the future of steelmaking. The World Steel Association estimates that in 2017 global ferrous scrap availability was about 750 million tons. In the next 30 years scrap availability is expected to grow by more than 500 million tons. The strongest growth in this market is expected from China which will likely represent at least 25% of accessible volume. What does more available scrap steel mean? The growth of the scrap steel market can help the world conserve raw materials and reduce the amount of energy needed to produce new steel. Environmentally positive measures worldwide should contribute to the growth of this industry as well. Of course, it is easy to imagine more scrap available in the global market would have a negative impact on the volume of new crude steel produced. It is likely though that no matter how much the scrap market increases there will always be a need for newly produced steel. Advanced Remarketing Services will continue to report on the scrap metal market in our monthly Market & Metals blog. Additionally ARS will follow global steel production and the impact of new regulations or taxes.